The BART police officers said Noah, a homeless resident, might be hard to look at when we found him. They knew from his mother that he was in bad shape, probably needed to go to the hospital, and they were intent on finding him and making that happen. 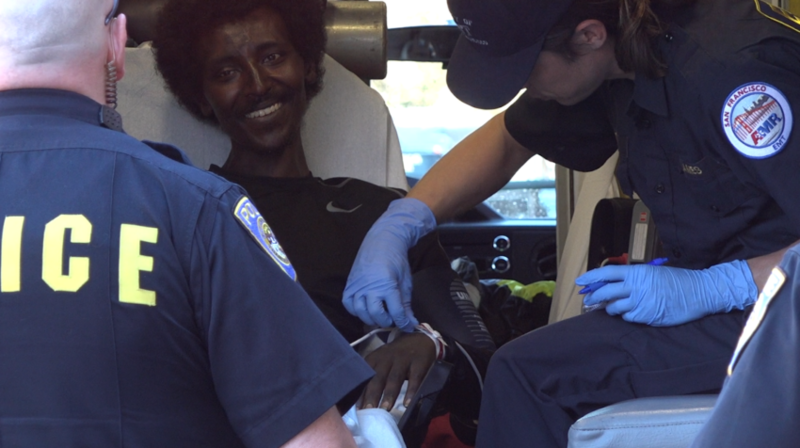 Touye and Rosenbaum hopped on BART at the Powell Street station and just as the officers suspected, they found Noah outside the Civic Center station on the corner of Market Street and 7th Street. He was still in blue scrub pants from a recent hospital stay, only now the pants were covered in dried blood. Open sores covered his arms and legs. “On a scale of one to ten, what is your pain level?” Touye asked. “He doesn’t want to kill himself, but he is killing himself,” said Touye. On that recent October day, officers called for an ambulance that took Noah back to the hospital. But on another day, when he does not need immediate attention, they will connect Noah to the Law Enforcement Assisted Diversion pilot program – one suited to Noah and other habitual users. The program started in Seattle in 2011 and is now used in 11 cities across the country. In Seattle, its participants were 58 percent less likely to be arrested than those who went through regular criminal justice processing. In other cities, participants were 89 percent more likely to find permanent housing and 33 percent more likely to have an income or access to government benefits. San Francisco is at the start of a two-year, nearly $6 million pilot test in the Tenderloin and in the Mission District, where 56 percent of the city’s homeless reside. Many of those – 65 percent – report habitual alcohol or substance abuse. The city estimates that there are some 7,500 people like Noah living on the streets. The pilot’s funding will connect 250 of them to health and social services rather than arresting and detaining them, according to Rachael Kagan of the Department of Public Health told the San Francisco Examiner. San Francisco would like to see similar results to those in Seattle. Touye and Rosenbaum are optimistic about the program’s success. “With other diversion programs we have to arrest them or cite them,” said Rosenbaum, referring to programs like the San Francisco Pretrial Diversion Project and the San Francisco Drug Court programs that refer offenders to social services after a court date. “You’re talking about huge windows of time and people are falling off the boat,” Rosenbaum added. The officers believe Noah will be a good candidate for the program because he is not defiant. When the ambulance arrived, the officers helped Noah climb in and take a seat on the stretcher. For the first time in the hour since the officers approached him, Noah was grinning from ear to ear. After the officers said goodbye to Noah, Touye called Noah’s mom. He told her the hospital Noah would be at so she could advocate for him. If Noah had been ready for the program, the officers would help Noah into a squad car and take him to the Community Assessment and Service Center, run by the Adult Probation Department. It will serve as the intake center for program participants. There, police can drop off participants who will be handed off to professionals who will find caseworkers, healthcare, job assistance and mental health services. Mayor Ed Lee has already introduced a $27 million proposal to expand the program and allow the intake center to be open 24 hours a day. This story has been corrected. The officers in the story work with BART and are not part of the SFPD.